92.48 is the percentage of people in an online poll who voted in favour of Tabung Haji keeping the Tun Razak Exchange (TRX) land it bought from 1MDB. Staggering, but hardly surprising. Yes, when the deal was publicised and politicised last month, some quarters manufactured such a ruckus that PM Najib Razak was compelled to ask the management of Tabung Haji to let go of the property to appease the protestors. But you had a feeling all along that it was a clever conspiracy against anything related to 1MDB. Turns out now that in every ten people polled in Capt Rahmat bin ex-IGP Tun Haniff's survey (over 3,000 people took part, three times more than Merdeka Centre's normal sample), only half a man (or half a woman) is actually against the deal; the other 9-and-a-half want TH to keep the land. Read TH-TRX and poll result. In TH-TRX's case, most right thinking people ask themselves pertinent questions and eventually get answers. 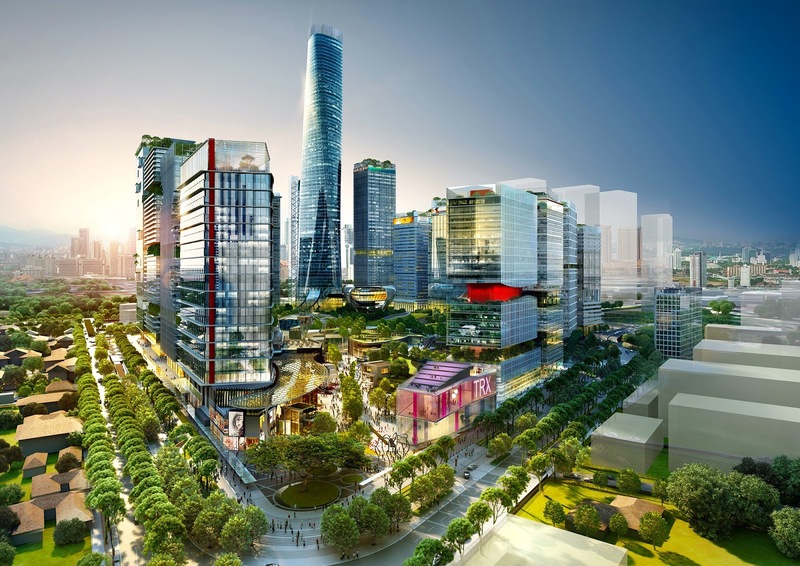 You can do the same: If it was bailout, why would Indonesia's Mulia Group pay nearly 20 per cent more than what Tabung Haji paid for a similar plot of land? Why are Chinese and Japanese investors queuing up also? 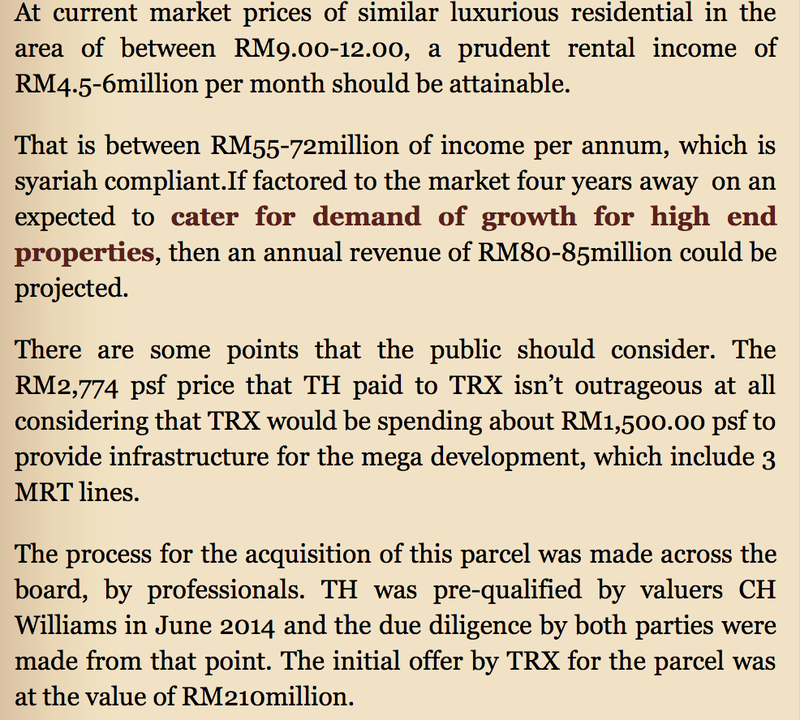 Property developer shrugs off 1MDB controversies, considers investment in TRX [The Mole, 26/5] and Political perception not factor for potential 1MDB investors. More importantly, if Tabung Haji is allowed to sell the land (for a hefty halal profit, no doubt), what's left for Malaysians in TRX? Takkanlah semuanya menjadi hak milik asing? Interesting...it looks like >92% of Malaysians don't give a sh*t about transparency, conflict of interest and good governance when it comes to corporate transactions?! It would be interesting to see the results IF our good captain were to make another round of polling, this time around the qualifying samples/respondents would be people who have accounts with Tabung Haji? One main reason...ni tanah shubaha. Jual beli yang cukup meragukan dan penuh dengan fitnah. Jual tanah ini untuk mengelakkan TH dipalit oleh fitnah dan membantu kemungkaran 1MDB. THP should keep the land. Al lot of silent majorities out there not in the poll support THP land deal. Should the seller is UDA, Amanah Raya or Khazanah, I think no noise will be aired. At last the enemy of Malay Muslim is laughing that their mission is successful. "TRX will be 100% foreigners' unless Tabung Haji keeps its land"....it beats me to see this kind of bugis-prince-putar-alam argument...in the 1st place the land was supposed to be developed for the interest of Bumiputeras...the bugis prince's 1MDB bought the land dirt cheap and sold it mostly to foreigners AND NOW IT LOOKS LIKE EVERYONE FORGOT ABOUT THIS REASON and started justifying for TH to keep the land for the sake of Bumi's interest...only bugis prince's mentality could justify this kind of convoluted thinking...well maybe most of the supporters out there are bugis after all...no wonder? 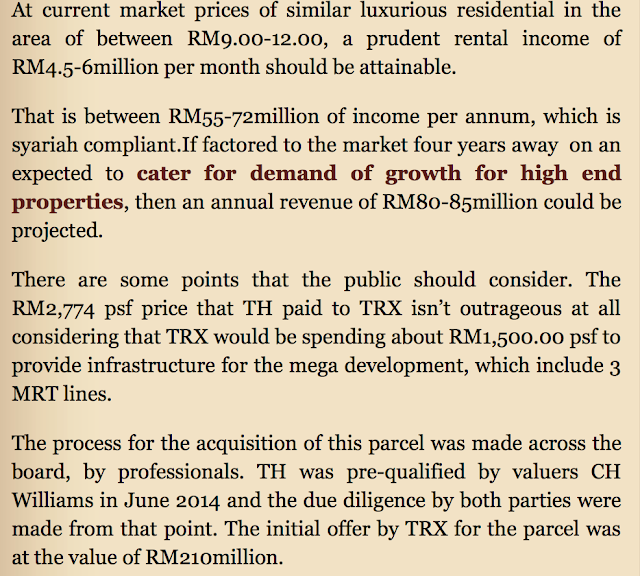 The govt should have sold TRX to TH and not to 1 MDB . we will see wht the silent majority thinks. Ha ha, the accuracy of online polls. Annie had to take her poll down because the BN clicking-maggot squad were out in full force to "fix" the results. Anwar Al-Juburi's Umno-sponsored counter-petition was disqualified when the White House discovered that about 65% of the "signatures" were fake. More pertinently, why did TH disregard the advice of its own risk assessment committee and proceed with the purchase, and why did your paymaster kencing so copiously in his Bugis spender, and order the land to be sold immediately? That's the most telling of all, isn't it? No late, afterthought spin can conceal that reaction. Agree with 7:30 a.m. - the silent majority ain't amused. Come 2018, you may need to get a real job, Latuk. The whole thing is messed up. TH "force" to buy, then "advise" TH to sell immediately. Then, politicians get involve again and say don't sell because it can make profit. TH should be independent. Because it is not, it is susceptible to conflict of interests and corruption. Gambling with other people's money is always fun. If you make money, you are a genius. If you lose money, well the market conditions is bad. 100% foreign owned. Who is the genius that is selling this national assets to the foreigners? Well that's right, 1mdb. So that logic is flawed. No need to spin and try to justify the existence fo 1mdb. Najib should go. But then again he does not care who we vote for. UMNO deserves to be punished but he is confident he can gamble that umno can stil win. maybe he is right afterall. It is time for Malaysia to be the Phillipines of the 80s. Rocky - your reasoning DO NOT hold water. The perception that TH bailed out 1MDB is not going away anytime soon. And perception is key to electoral votes. Najib take note. Is this the way business make SOUND decisions. So Rocky, Brick, BigDog (wow hard and intimidating names) must ask themselves whether they are on the right track in their attempts to defend Najib's kecut tel*q administration. This is the blesses month of Ramadan and these 3 bloggers plus others must aks Allh for some "petunjuk". May you be enlightened enough to see the truth after putting aside personal and emotional inclinations. The DEVIL is in the details. Why must full payment be made to meet 1MDB's deadline for debt payment?? A lot of silent majority and a lot of unhappiness. TH should have kept the property. The investment is worth it. TRX will be 100% foreigners' unless Tabung Haji keeps its land, ha ha ha .Datuk masa beli dari Government Najib tak fikir pun siapa yg akan own that land. Bila dah jadi milik TH baru cakap soal ownership of TRX. Sudah la Datuk, jgn bangkitkan soal patriotik. Bila baca rasa nak termuntah. Wow!!! TRX land supposed to for buniputera now become 100% foreigners own. Double wow flr you rocky for not highlighting this. Paid or not, these blog commentators can be seen every where whacking at 1MDB to stop any attempt at an explanation. Their arguments are repetitive, only logical at the surface and political argument style simplicity. Just like doubt expressed on online survey as representative of silent majority, one can also doubt the majority of commentators are not representative of silent majority too. "So Rocky, Brick, BigDog (wow hard and intimidating names) must ask themselves whether they are on the right track in their attempts to defend Najib's kecut tel*q administration." Hmmmmm....Whats cooking dato rocks? Ada komplot between the three of you? If you have any information on or against Tun M, jangan simpan , ledakkan , lepaskan. Pada zahirnya mereka bertiga mengaku bukan pro ahjibgor, tapi dalam masa yg sama mempertahankan tidak cekap, tidak amanah dan tidak bersih pentadbiran najib ini. Apabila 1mdb meragukan, timbul syubha, apabila syubha bolehkah kita 'berkhalwat' dengan perkara was was? adakah ianya dibenarkan dalam islam?